Obituary – Mooter, Edwhite C. « Perry High School Alumni Association, Inc.
Obituary – Mooter, Edwhite C.
Ed Mooter, Wichita Falls, Texas, formerly of Perry, died Friday at Wichita Falls. Funeral was Saturday at Wichita Falls. Mooter was the son of the late Mr. and Mrs. Lonzo. J. Mooter, long-time Perry residents. 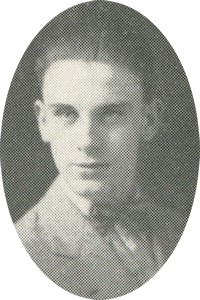 He was a 1929 graduate of Perry high school. He was married to the former Frances Skalenda of Perry who survives. Mooter was a member of Fain Memor­ial Presbyterian church and was owner of the Calvin Gas Co. in Wichita Falls where he resided the past 37 years. Other survivors include a daughter, Mrs. William ( Patricia ) Bryant, Wichita Falls; a son, Kenneth Mooter, Dallas; a sister, Mrs. J. M. Hoot, Perry; and six grandchildren.